The solution to all your lawn and outdoor needs! Grass Roots Solutions is a property maintenance business that focuses on providing top quality service to our customers at unbeatable prices. Stop paying too much for lawn and outdoor services. Switch to us and get an even BETTER quality service for a LOWER price. What more do you need?! ALL SERVICES ARE SATISFACTION GUARANTEED! 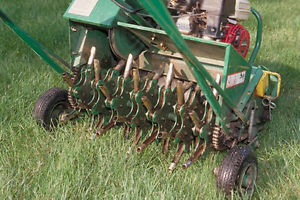 We are currently offering lawn core aeration for an average price of JUST $40! PLUS we take $5 off your quoted price for every referral! Got a friend/neighbour who needs their lawn aerated? That will save you money! Contact us today and we will give you the price of lawn aeration for your home. Averaging only $90 for a full house eavestrough and downspout cleaning, we remove all debris from the eavestroughs by hand and ensure they are completely clear and clean. Next we run a hose down all downspouts to ensure they are clear and unclogged. This is a step often missed by other companies but is crucial to avoiding clogs and causing the eaves troughs to overflow. ONLY $160 FOR 1 YARD OF HIGH QUALITY BLACK LOAM SOIL! Thats right! Just $160 + hst for 1 yard of high quality soil delivered and spread where ever you need it! Whether you need your gardens topped off or the loam spread all over your lawn to give it that "kick" this Spring, have us come and do all the work for one low price! ​Black loam is the same soil that gets delivered in the big yellow bags. Its full of nutrients and perfect for the lawn and garden. ﻿COMBINE SERVICES AND SAVE! WE OFFER GREAT DISCOUNTS FOR MULTIPLE SERVICES! Grass Roots Solutions offers flexibility, reliability, and service like none other, at FANTASTIC prices. We are a small business with very low overhead costs, allowing us to strategically price below our competitors. Beings a small business, we value every customer we retain and believe in taking the time to make sure each customer is fully satisfied with our services. We’ll do what it takes to make sure you’re completely satisfied. And of course, we are fully licensed, registered, and most importantly, insured. Trust us and try us out! The lawn service industry is extremely competitive, giving you a huge variety of companies to choose from. This can seem very overwhelming as there are so many property maintenance businesses available to you, all offering relatively similar services with very competitive prices. At Grass Roots Solutions, we acknowledge our competition and strongly encourage customers to research our competitors to see where we stand in the industry. We know where we stand, and we want you to know too! We price our services below all of our competitors, as well as provide significant discounts on our packaged services, saving you A LOT compared to our competition. This Spring we suggest getting The Works for you lawn!